COMPANY PROFILE Debenhams PLC through its subsidiaries is engaged in the sale of fashion clothing and accessories, beauty and gifting products and products for use in the home. Debenhams plc is a United Kingdom-based company that is principally engaged in operating department stores through multichannel business. The majority of Debenhams’ stores are located in the prime positions of the U.K. The company also has a number of stores outside the U.K. including a few own operated stores in Ireland and Denmark and some franchised stores in other overseas areas. The company’s online platform is available in many countries. The company offers a mix of owned, international and concession brands, with a broad range of apparel, cosmetics, electrical appliances, home furnishings, food services, and other. 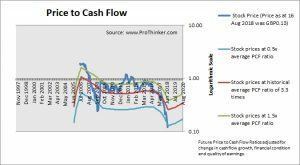 At the price of GBP0.13 as at 16 Aug 2018, Debenhams Plc is trading at a Price to Cash Flow Ratio of 1.7 times last 12 months cash flow. 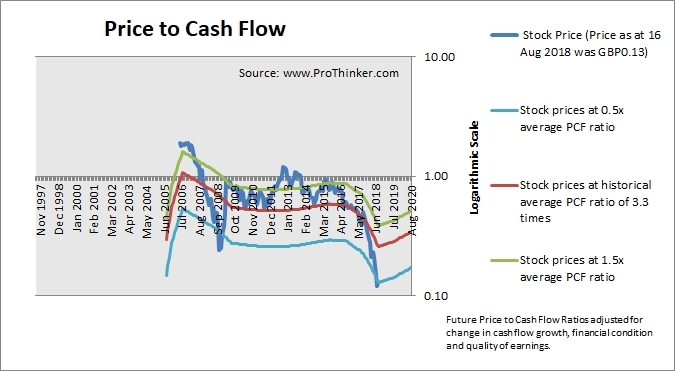 This is a 50.0% discount to its historical average Price to Cash Flow Ratio of 3.3 times.